Six Months to Live . . .
Artie Boyle was a run-of-the-mill American hockey dad. Then terminal cancer happened. The best doctors despaired. And Artie dared to look for a miracle. Artie had never put much stock in mysticism or miracles. But when his best friends bought tickets to fly with him to Croatia to the controversial shrine at Medjugorje where healings were known to happen, he dared it all. They found themselves in powerful ways sharing spiritually, even praying together, something they would have found very odd before. And when they came home Artie was healed—completely. The cancer was gone. The doctors at Mass General Hospital were astounded yet could offer no explanation. 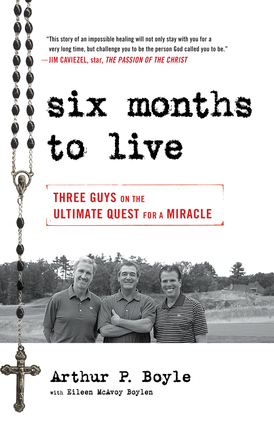 Six Months to Live relates not only Artie’s miraculous healing but his spiritual transformation and the hope and inspiration he offers to thousands who hear his story. Arthur P. Boyle has traveled the world speaking to thousands of people in North and South America and Europe since his miraculous healing from cancer in Medjugorje in 2000. He and his wife Judy have 13 children, including professional hockey player Brian Boyle of the New York Rangers. He lives in Hingham, Massachusetts. Eileen McAvoy Boylen is a freelance writer and regular contributor to the Boston Globe and the Boston Herald. She also runs a successful communications consulting business writing web copy, marketing materials and e-newsletters for companies in the Boston Area. She lives in Hull, Massachusetts.